Yes, I KNOW that this is a cheap shot, but I simply cannot resist. On April 17th, 2013, a fertilizer storage facility exploded, killing fifteen people and injuring more than 160. The people of West deserve more than to be remembered as the point of a political meme, but this example of corporate largesse begs to be stated as bluntly as possible. For the last 40 years, corporations have successfully brainwashed the voters, most of whom now believe “regulation” is a bad word, and believe that governments who want to prevent corporations from maximizing their own profits, regardless of consequences, are evil. How many times have you heard the mantra that OSHA interfered with my business? Staffing and funding OSHA has been demonstrably reduced because of calls for deregulation. Corporations are not evil any more than government is evil. However, they do exist to make profit, for themselves and for their stockholders, and they exist for no other purpose. It is up to government to ensure that corporations function within the parameters of protecting the environment and ensuring the safety of innocents who just happen to live nearby. It is long past time that we stop viewing government regulation as a bad thing. 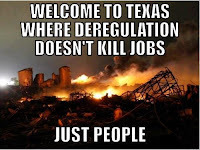 What the current US and Texas state governments needs to embrace is the notion of smart regulation, regulation that serves the higher purposes embraced by the majority of humanity. 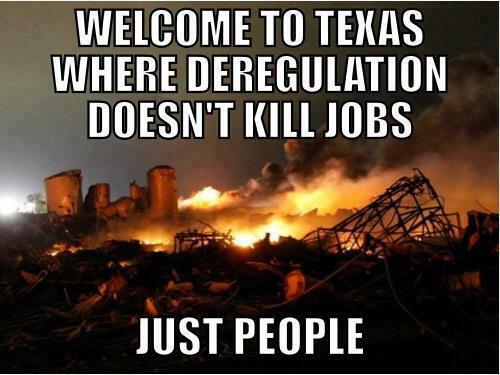 This includes protecting the environment and public safety, something wholly lacking in current Texas regulations. The Senator from Canada and the congressional rep for West, Texas and the surrounding area have made the issue a political football because of their stands against Hurricane Sandy relief, while simultaneously asking for aid for this. This hypocrisy cries out to be corrected. Facebook Status and related edited comments backdated to the blog. A h/t to a Facebook friend is also in order here. As of this posting (04/23/2018) changes to the regulations that lead to this disaster in West have been completely inadequate to keep another such tragedy from occurring. The state government still doesn’t know where these kinds of storage hazards exist. Roger Williams remains the representative for West, Texas and my representative here in Austin. Here’s hoping both he and Ted Cruz are replaced in the upcoming midterms. Changes made to the US regulatory codes by the Obama administration following this disaster have been weakened by the administration of the Orange Hate-Monkey. Previous Previous post: Multi-Level Marketing; No, It Doesn’t Pay.